Engagement photos are typically a romantic affair—a couple will look lovingly into each other's eyes on a beautiful beach or in a scenic forest. They also typically don't contain black metal bands. That wasn't the case, however, for John Awesome and Nydia Hernandez, who just wanted to enjoy the romantic atmosphere of Holy Jim Canyon in California and take some engagement photos. Black metal band, Coldvoid, always wanted to enjoy that same atmosphere and take some promo pictures. And, yes, the two parties accidentally ran into each other's photo shoots. “We just randomly thought it would be a funny idea if we could get them to be a part of our engagement shoot. So we approached them and asked and they more than happy to accept! Super nice people. I seriously can't make this stuff up,” Awesome told ABC News. 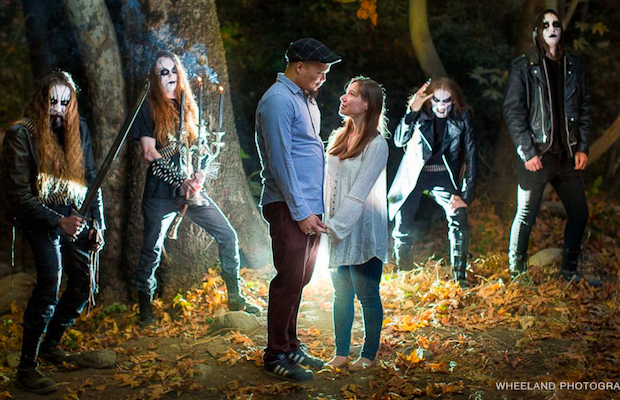 That “funny idea” resulted in the best engagement photos you'll see all year. Every band knows the importance of getting your name out there, so Coldvoid even gave the couple a free copy of their demo. What do you think of the engagement photos? Let us know in the comments!